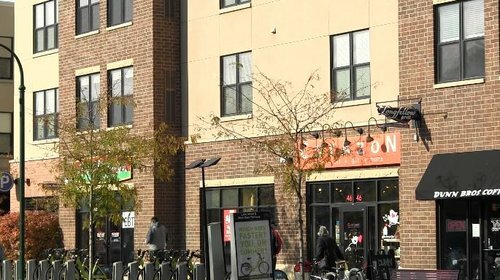 Susan Zdon owns Corazon Gift Shop, located in a mixed use development project of the Longfellow neighborhood in Minneapolis, MN. She moved the business to its current location in 2007. Susan knows mixed use developments because she has been in 3 different projects since opening her business. Mixed-use development projects are becoming the standard for today’s developer. This is good news for the small retailer trying to enter the market or expand its number of locations. By definition, a mixed-use development is one that encompasses more than one function and typically consists of retail (on the ground floor) with residential housing (apartments or condominiums) and office space above. As the value of urban property increases, particularly in the core, run down properties become prime pieces of real estate ripe for this type of development. In addition, local communities are beginning to insist on this type of development. Not only are such developments aesthetically pleasing, they often reduce peoples’ reliance on automobiles and provide larger green spaces that the community can enjoy. This type of development is perfect for the small retail tenant. Spaces are smaller, rates are generally more competitive than neighborhood centers or regional malls, and customers typically live in the area, allowing the retailer to develop a loyal following with repeat customers. Susan’s first location was in the warehouse district of downtown Minneapolis. Even though that space was larger, Susan felt somewhat isolated. Plus, this particular property was not in top condition. “Once we moved to the new location it was an instant success” Susan told me. “Our sales increased 25 to 30% very quickly”. The new mixed use development is located on the West Mississippi River Road, and it a natural draw to the area. In fact Susan says that to be successful the project needs to be in a location that draws people. Your business will not be enough to pull people in. The main floor of the current location features 2 food services, one a moderately priced sit down restaurant, the other a takeout pizza shop. Of the two, the sit down is a natural draw of customers for Susan’s gift shop. The Pizza shop on the other hand has a stream of customers who don’t tend to stay and browse. When asked if other gift shops should consider a mixed use development property Susan said yes, provided they follow some general guidelines. 1) Do demographic studies to ensure there is a market for your business in that area. 2) Be aware of how the entrance is presented to the public (can they see you from the street?). 3) Make sure there is ample parking. 4) Only locate your business in an area that people are already coming to. 5) Find a project that has a sit down restaurant. The items above are guidelines Susan sticks by. At one point she expanded into another mixed use location. Since it was in an upscale area, she didn’t do an in-depth demographic study. “It was a complete disaster.” according to Susan. Her product mix and the flow of traffic caused her to close that location as soon as she could. Susan currently is looking for other opportunities but will only get serious when she finds a mixed use development project that meets her requirements. Bob Johnston is a commercial real estate broker in the Twin Cities and is a hosted writer for the website GreatBusinessContent.com. Great Business Content provides small business owners with articles, video interviews, and information for all facets of running a small business.